Can single element induction cookers perform as well as traditional countertop models? Induction cooktops ace our testing, but that sizzling performance doesn’t come cheap. How do portable models available for just a small fraction of the cost stack up? Rather than being built into a countertop with a dedicated power supply, portable induction cookers have a single element, sit on top of a counter and plug into a power outlet. They’re useful for cooking wherever space is tight, think an apartment or bach, or plugged in outside to complement a barbecue. Though it has just one cooking element, the Breville has all the features of a full-sized induction cooktop: a 2100W element, eight cooking modes, a keep-warm function, touch controls, timer, pan detection, safety cutout and child lock. My first cooking trial, lamb schnitzel, opened my eyes to my electric cooktop’s inefficiency – the meat seared instantly and browning was even across the pan. Further trials reinforced my initial delight. On full power, a litre of water boiled in three-and-a-half minutes (the best my cooktop managed was nine minutes). On a low power setting, milk warmed gently and butter softened and melted, but didn’t burn. For each trial I selected a pre-set cooking mode, such as “sear”, “water boil” or “milk”, which adjusted power output to suit the task. However, making tomato pizza sauce was more troublesome. The “simmer” mode sets power at 1400W for 10 minutes, reducing to 400W for a further seven minutes, then 200W until the end of cooking. The initial power was useful for frying garlic, but then it remained high for too long and splattered tomato sauce everywhere. I could reduce power on the fly and eventually found a setting that worked, but the preset levels caught me out. I put it down to a learning curve from my manual electric cooktop. The Quick Cook isn’t quiet in operation. A fan runs both during and after cooking to cool the surface. It cools very quickly, as it only warms through residual heat from the pan. Lifting a pan off the surface while cooking causes a warning beep, then another beep when it’s replaced. 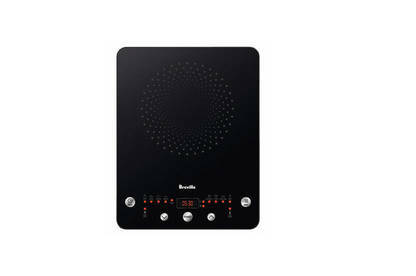 The incessant beeping would get annoying for tasks, such as stir-frying. Overall, I was impressed with how much performance Breville packed into a cooker often available for less than $100. It wouldn’t look out of place in a flash kitchen. If I could change anything, I’d like a simple option for manually controlling cooking power. Otherwise, I was left wondering why its full-size counterparts are so expensive. For use with induction-compatible cookware with a 12cm to 23cm base diameter. You can go even cheaper than the Breville. 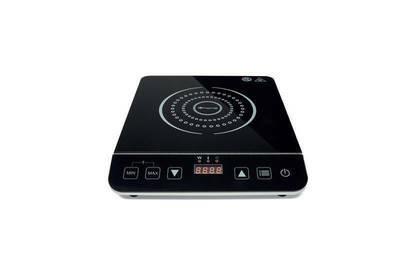 The 2000W Anko Induction Cooker costs $49 and is exclusive to Kmart. Surely, it can’t match the performance of a cooktop that costs 30 or 40 times more? It doesn’t come with all the Quick Cook’s features – there’s a timer, pan detection, control lock and overheat cutout, but that’s it. There are no cooking modes, you set the desired power or temperature – simple, but actually rather effective. There’s little to knock with its basic performance: on full power, water boiled in three-and-a-half minutes; on low power, butter melted but didn’t burn; and I produced beautifully seared lamb schnitzel. But the Anko looks and feels like it cost $49: edges are rough with glue overrun, touch controls are less responsive than the Breville, and it has an “unfinished” gap between the controls and cooking surface that caught spills. During the searing trial, the surface overheat cutout tripped. And, while the fan was no noisier than that on the Quick Cook, it had a worrying rattle. The Anko induction cooker worked as well as a significantly more expensive cooktop and I can’t fault that for its price. However, its overall finish and build quality made me wonder how long-term my $49 investment would be. For use with induction-compatible cookware. You have just made me find the dust on the bottom of my humble "Homemaker" single induction hotplate which I have happily used for several years as a replacement for the Sunbeam model that collapsed after ten or more years' use. I think I bought it from a Trade Me store. Some months ago I bought the Breville model you reviewed as further protection against the open flame of my gas hob and I completely agree with your comments, the difficulty of adjusting the automatic heat settings is vastly annoying when one is used to a simpler appliance, had I known of this feature I would not have bought it but now perhaps I'll make an effort again. The other plates I have used were completely satisfactory and neither of them developed scratches.